We’re kicking off this week in the Entry with a triple-headlining show, featuring talent exclusively from around Minneapolis. Each of these local favorites feature their own twist on wildly different genres, so it is expected to cater to the interests of most Minneapolis concertgoers. The Minneapolis Chamber of Roustabouts are some hard-hitting lo-fi junkyard music. They've got a bit of hip hop and a bit of grunge and even a cello on stage. Note: must see to believe. Half Irish pub, half punk group The Tim Malloys weave the sounds of traditional Irish rock and classic Minneapolis sensibility, releasing records around the metro since 1994. In a relative turn of pace, Marah in the Mainsail will also be putting on a performance, a favorite of local Trampled By Turtles and folk music fans alike, with a slight nod to punk music on many of their tracks. Stay up on the locals! Catch all three performances Monday night. 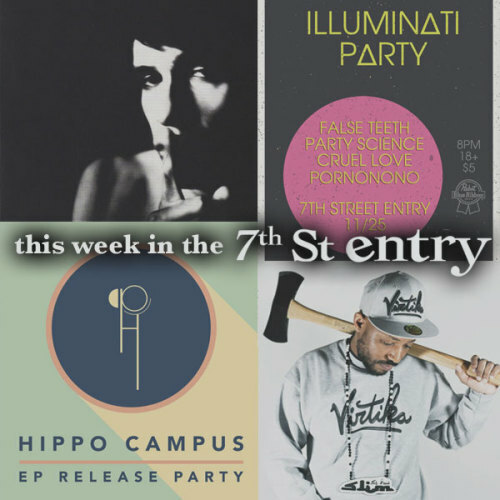 It is going to be a mysterious night in the Entry on Tuesday night, highlighting local talent during the ILLUMINATI PARTY. Genre-crossing group False Teeth will be performing in the Entry for the first time, with ability to switch between classic indie rock and nu-wave hip hop effortlessly within their tracks. Bobby Phisher & Matt Sandstedt combine to make up this local duo, touring behind their newest EP, Grapefruit. Lo-fi trip hop artist Cruel Love will also be co-headlining the Illuminati Party. Minneapolis artist is yet another genre-crosser incorporating a fuzzy electronic sound throughout her debut self-titled record which was released this past October, featuring a few hip-hop features that might surprise you. Other acts include Party Science and the self-described post-sexual-future-history group Pornonono. You certainly wouldn’t want to miss that. Hard-hitting rap fans are expected to be flocking to the Entry this Wednesday as St. Paul Slim will be headlining his own show, presented by True North Entertainment. He will be accompanied by a slew of budding hip-hop artists including D. Cannons, Nicky Gwiggs, Walt Trab, Po’etikit, Create & JAYLAP, Halogen One, David Graft, and the infamous SOFTPORECORN. St. Paul Slim has worked as a father-figure of sorts for many artists like the one featured this Wednesday night, working to breath fresh air into the Twin Cities hip hop scene. He is known for performing prolifically, wherever he is needed and his ability to win over non-listeners within just a few tracks. If you haven’t heard, check him out this Wednesday. New-age electronic acts will be taking the reigns of 7th St this Thursday, highlighted by Profresher, responsible for some of the freshest and most crisp synth lines playing today. With a 90’s throwback feel throughout his catalog, there’s no reason why anyone at his set won’t be groovin' out and shakin' booties. He will not be alone either, being accompanied by acts such as Meinong’s Jungle, known for their eclectic sound stemming from just a two-person group led by artists Sam Rivkin and Eric VanderVorste. They incorporate glitch, jazz and hip-hop into their sets, often playing improvised shows. These two acts will be joined by local collective Upstanding Hoodrat, combining their jazz knowledge with live hip-hop and EDM, creating a highly unique sound that begs to be heard live. Alien Brain Food will also be performing, catch all of these local electro-wunderkinds Thursday night at the Entry! Minneapolis’ favorite rock band hasn’t booked their return gig at First Ave just yet, but in the meantime some of the best talent in the area will be performing some of their hits, as well as a rendition of the classic Replacements album Don’t Tell A Soul. Local features include Gabe Douglas of the 4onthefloor, Curtiss A of Twin-Tone records, budding indie talent Frankie Teardrop and members of Hippo Campus, Night Moves, and tiny deaths. It’ll be a local event on all fronts, so be prepared to groove out and discover a few artists you might not know this Friday night. It’s always an extremely-anticipated event, so get there early! Minneapolis darlings Hippo Campus will be celebrating their newest EP, Bashful Creatures, this Saturday in a sold-out release party in the Entry. The gatekeeper of all up-and-coming bands in Minneapolis is known to be a sold-out Entry show, and these former U students have done just that. Dominating college radio indie rock stations across the country, notably at Radio K, these four young indie-dance-rockers have earned themselves a large local following, and while they have appeared on many First Ave bills previously, it appears they are emerging from their shell-- and will hopefully be making the Mainroom jump soon enough. Expect big things of this group, ranked as one of the best local acts by CityPages the last few years, narrowly edged for the top spot this year. Local music fans unite-- we will be hosting four budding bands from around the Twin Cities on Sunday night. The Drug Budget, well-known for their large presence on stage, literally and figuratively. The group boasts 15+ members on stage and using their size to their advantage, with the ability to trade vocals and solos seamlessly, the groups still feels very tight. Garage rockers Nancy’s Raygun will be joining the bands onstage, with their single “My Kitchen Table” working with some serious Radio K airplay, and fuzzed out guitars all around. Chalk is another UMN staple band, with their stellar garage shows and Modest Mouse-feeling jams led by talented frontman Michael Voller. Danger Ron will be bringing his band, The Spins to the Entry also - the four piece rock band described as “danger rock”. They plan to be touring nationwide in 2015, so catch ‘em here while you can.